Sigh, here we are at Sunday night again, another weekend flew by too fast! I did survive my nephew’s birthday party yesterday and the two raw dishes I took were a hit. 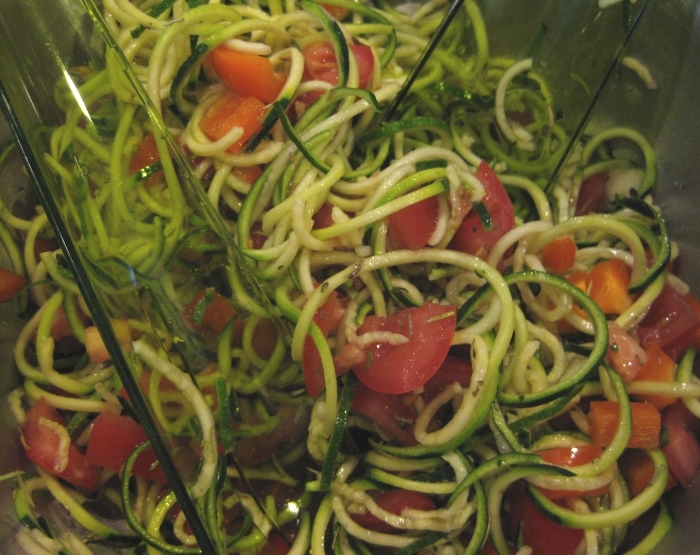 For the side dish (or main for me) I decided to take Ani’s Simple Oregano Rosemary Noodle Salad. But I ran out of avocados from making the key lime pie (two turned out to be bad :-( ), so I added chopped orange pepper instead to add more color. 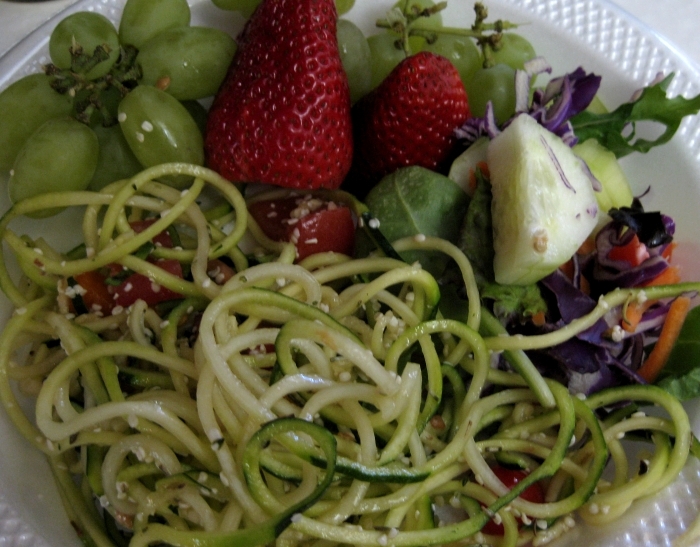 I figured this dish would be good because I didn’t think anyone at the party has been exposed to zucchini noodles or any spiralized veggies and it seemed like a fun dish for the kids. 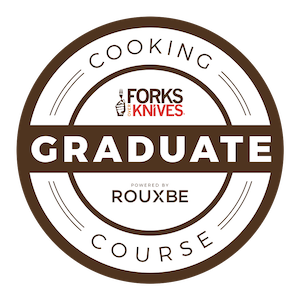 It did pretty well, everyone seemed to enjoy scooping large noodles onto their plates and were surprised to learn they were raw zucchini. While most of the guests loaded their plates with tacos and tamales catered by a Mexican place, mine was quite colorful with fresh produce. It was nice eating light, I had plenty of room for the raw key lime pie dessert. 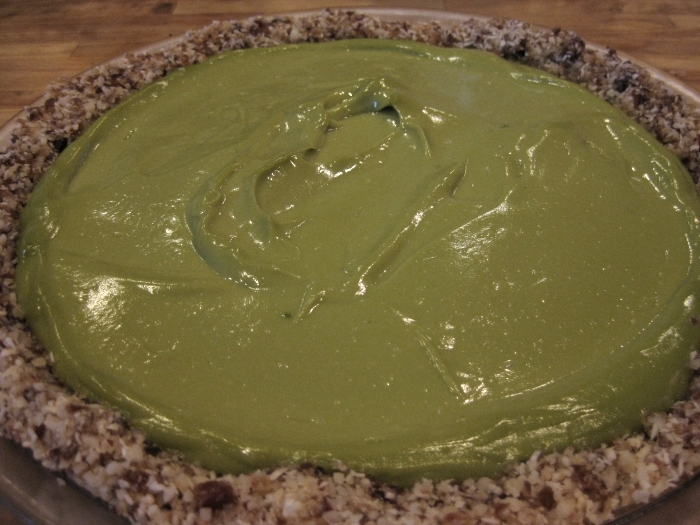 This was my first time creating a raw key lime pie and I decided to try this recipe since it was relatively simple and didn’t require too many exotic ingredients. The finished product was gorgeous! 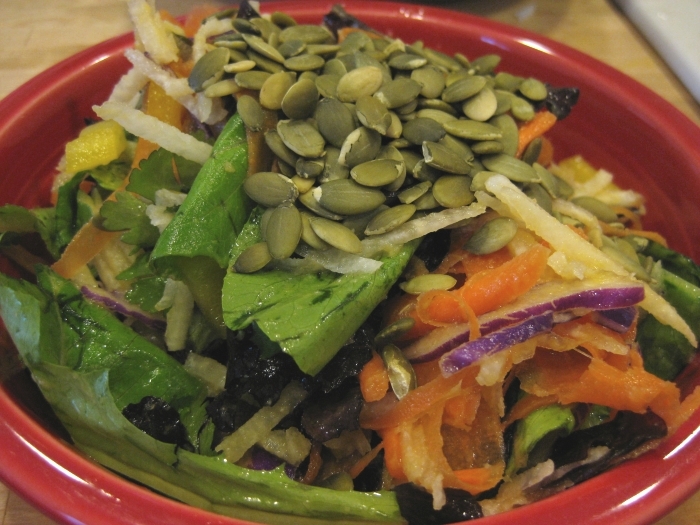 The pie was excellent, very close to what we had at Cafe Gratitude, though a little more messy. Everyone who tried is was surprised to learn it had no dairy or gluten. One guest was very grateful for what I brought because she’s gluten intolerant and couldn’t touch the cake or the catered food served. Most adults selected the pie over the grocery store bakery cake for dessert, but the kids stuck with the cake. Overall it was another great opportunity to expose people to healthy recipes that tasted good and were more than salads, I’d call it a success. We left the party promptly, 3 hours of screaming kids was good for one day. :-) We tried to go to PF Changs for dinner, but there was an hour plus wait and mostly high schoolers decked out for prom waiting. I’m not a patient person when it comes to waiting for a table, it there’s more than 15 minutes – forget it. So we opted for the nearby sushi place where there was no wait, but plenty for screaming kids. :-P I tried their vegan roll with avocado, onion and mushroom. 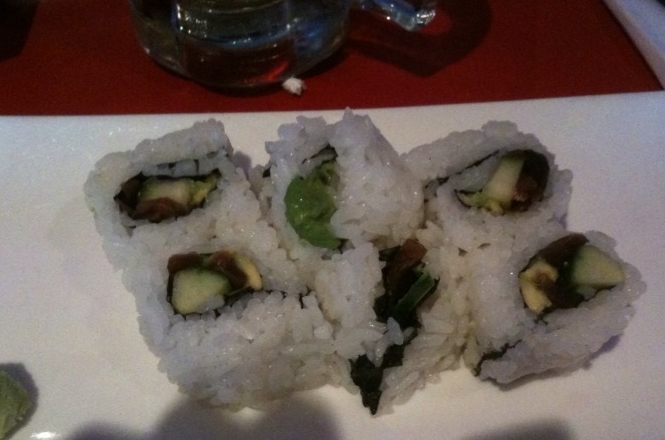 Not bad, but like most vegan sushi rolls, pretty plain compared to the huge, sauce-layered rolls hubby got. I had leftovers of Ani’s dish from the party and remixed it for lunch today. 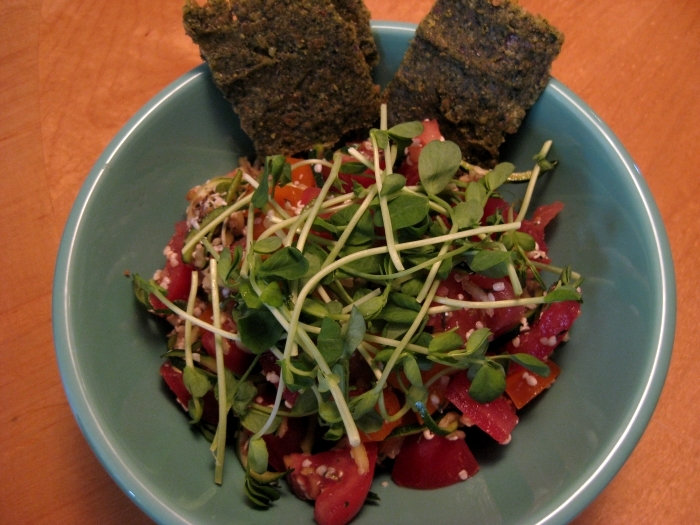 I added pea sprouts and hemp seed crackers, very good combo. I mixed the salad leftovers from the party with jicama, carrot ribbons, cilantro, yellow pepper, pumpkin seeds and Ani’s orange miso dressing for another colorful, unique creation. Aside from the macadamia nuts in the pie yesterday, I’ve been sticking to my no-raw-nuts experiment to see if raw walnuts and cashews could possibly be the cause of facial breakouts lately. 7 days of it and my skin is looking a lot better, no new breakouts and the skin on my forehead is not looking near as irritated and rashy as it was last week. I’m glad I may have pinpointed the cause, but a bit depressed that I have to cut my intake of my beloved raw walnuts and cashews. :-( After another week of testing, I will start reintroducing them back into my diet in pureed form and hope that is less irritating. Key lime pie is hands down one of my favorite summer desserts. Yours look great! Your pie looks so good! Raw desserts are so good :). Glad to hear that everyone liked it too. I can imagine that being gluten intolerant is tough, especially when there’s dessert so it was lovely that the guest got to eat your dessert. the spring rolls from the last post…omg to die for! I have been on a rice paper wrapper search for 2 mos and refuse to order them online and no one in Phoenix stocks them. crazy, i know. I dont like key lime pie but you could make me like it after seeing that! Yum!! Oh my PF Changs is alaways crazy, see we went for lunch, but Im sure if we went for dinner we would of had a wait too! Hey sushi is just as good!! Love ya girl! Have a great week!! This is exactly the type of blog I need to keep up on. I’m trying to go raw but can’t seem to take the plunge! all your meals look so good-so glad the pie was a success too!